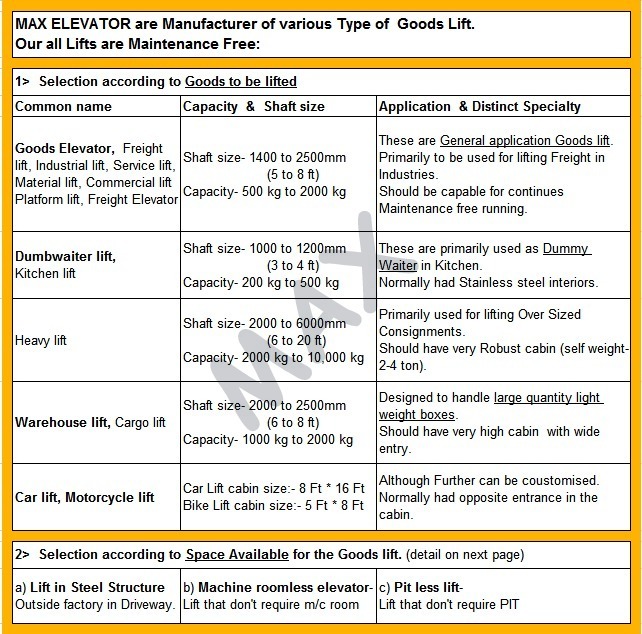 maxlift - lift manufacturer Page in delhi , India as of 21-Apr-2019 . MAX Elevator is the MANUFACTURER of Quality lifts since 1996. From last 21 Years, we have been steadfastly focused on manufacturing and delivering the best lifts in the industry. We have been a reliable name for elevators. Ever since our inception, our approach to manufacturing has been that equipment does not create problem. MAX Lifts are Maintenance free. This makes our lifts very functional in use. Our products are backed by an extremely dependable after sales service. We are dedicated to scale down the maintenance requirement to minimum to increase customer's satisfaction. Our Lifts are manufactured as per norms set by Govt. for license. For industries the license is mandatory and is issued by Government of India approved authority. Our Lifts got approval in all states like Delhi, Haryana, U.P., Uttrakhand, Rajasthan, Etc. & Lift in Steel Structure, Machine roomless elevator, Pit-less lift.